This April you are invited to join us, to hear seasons pass by the window, and to enjoy film stories by (new) filmmakers. 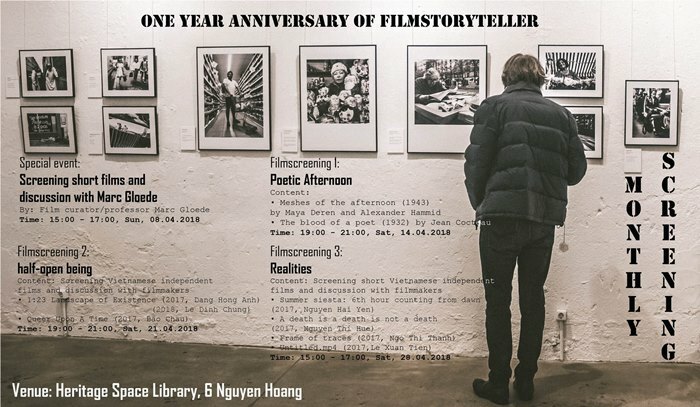 “FILM storyteller” is a screening program that concentrates on the diversity of accesses and ways of reading film from the vision of a storyteller – writer like a filmmaker. Through 3 activities: screening – discussion – review, like a suggestion, we also concern about the film as a material to flourish blossom of awareness and expression of and with participants.We would like to encourage and call for every discovery – submission – encounter – experience from the host – the watcher – the filmmaker to create chit – chat, talks, and more. Each participant will be given a chance to experience and challenge himself or herself in various roles to lengthen endless narratives. Heritage Space is a combination of a gallery, library, concert hall, co-working space, boarding room and outdoor space with the possibility of organizing exhibitions, concerts and performances, education and exchange, artists residency programs, and many other activities. Run by a team of curators, art researchers, and artists, Heritage Space is aspiring to become an intersection of individuals/groups/ organizations from a wide range of domestic and international creative fields, with a long-term goal to support and develop the creative industry in Vietnam. Free for members of Heritage Space Library (please bring your student-card or membership-card). Discussion: "The Question of Community"